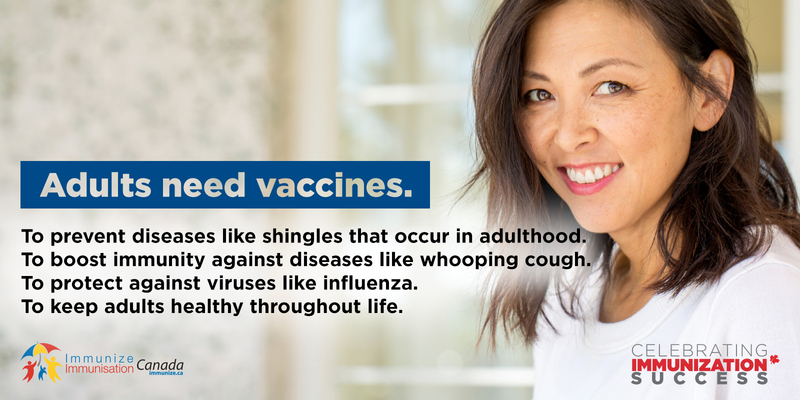 Adults require helper, or booster, shots to maintain immunity. As well, adults who were not adequately immunized as children may be at risk of infection from other vaccine-preventable diseases. They can also infect others. For example, adults who contract measles, mumps or pertussis (whooping cough) can infect infants who may not yet be fully immunized. Many new vaccines are only for adults, e.g. herpes zoster (shingles). Immunizations are not just for kids! 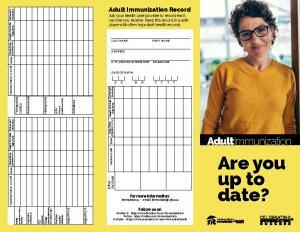 It is important for adults to stay up to date on their immunizations. Government of Canada: Provincial and Territorial Routine Vaccination Programs for Healthy, Previously Immunized Adults. This table summarizes the current routine (publicly-funded) vaccination schedule for healthy, previously immunized adults in all provinces and territories (P/T) across Canada. The Public Health Agency of Canada's guide, Not Just for Kids. An Adult Guide to Vaccination.